German pianist and composer; born at Worms July 17, 1839. He was a pupil of L. Liebe, Pauer, Rosenhain (piano), I. C. Hauff (theory), and H. Wolff (violin). At the age of eleven Gernsheim made his first public appearance at a concert in the Frankfort Theater, on which occasion one of his compositions, an overture, was performed. He later (1852) made a tour through the Palatinate and Alsace as far as Strasburg. Proceeding to Cologne, and thence to Leipsic, he continued his studies for three years with Moscheles, Hauptmann, Rietz, and Richter. After a supplementary course at Paris (1855-61), he gave there a series of concerts, and was recognized as one of the best interpreters of Chopin and Schumann. 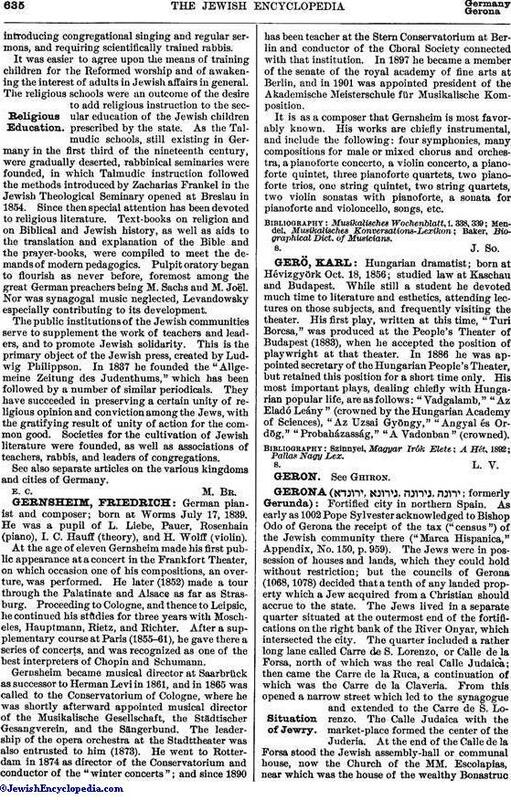 Gernsheim became musical director at Saarbrück as successor to Herman Levi in 1861, and in 1865 was called to the Conservatorium of Cologne, where he was shortly afterward appointed musical director of the Musikalische Gesellschaft, the Städtischer Gesangverein, and the Sängerbund. The leadership of the opera orchestra at the Stadttheater was also entrusted to him (1873). He went to Rotterdam in 1874 as director of the Conservatorium and conductor of the "winter concerts"; and since 1890 has been teacher at the Stern Conservatorium at Berlin and conductor of the Choral Society connected with that institution. In 1897 he became a member of the senate of the royal academy of fine arts at Berlin, and in 1901 was appointed president of the Akademische Meisterschule für Musikalische Komposition. It is as a composer that Gernsheim is most favorably known. His works are chiefly instrumental, and include the following: four symphonies, many compositions for male or mixed chorus and orchestra, a pianoforte concerto, a violin concerto, a pianoforte quintet, three pianoforte quartets, two pianoforte trios, one string quintet, two string quartets, two violin sonatas with pianoforte, a sonata for pianoforte and violoncello, songs, etc. Baker, Biographical Dict. of Musicians.